2020 will be simply the biggest anniversary celebrations in the USA in our lifetimes. 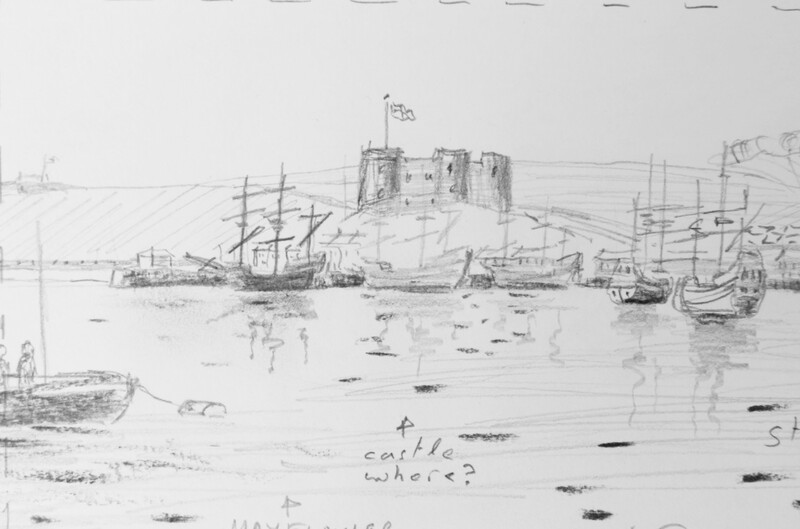 Mayflower concept sketches, page available, £130. 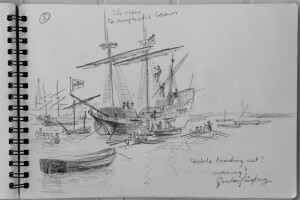 These newly researched scenes of The Mayflower’s famous voyage will be a fresh and authoritative visualisation aid contributing to the 400 th anniversary celebrations that will endure long after the event, continue to be seen as memorable by future generations, literally becoming a part of The Mayflower story. Mayflower 1 B in Sutton Harbour, Plymouth, N E view, concept sketch, available, £130. 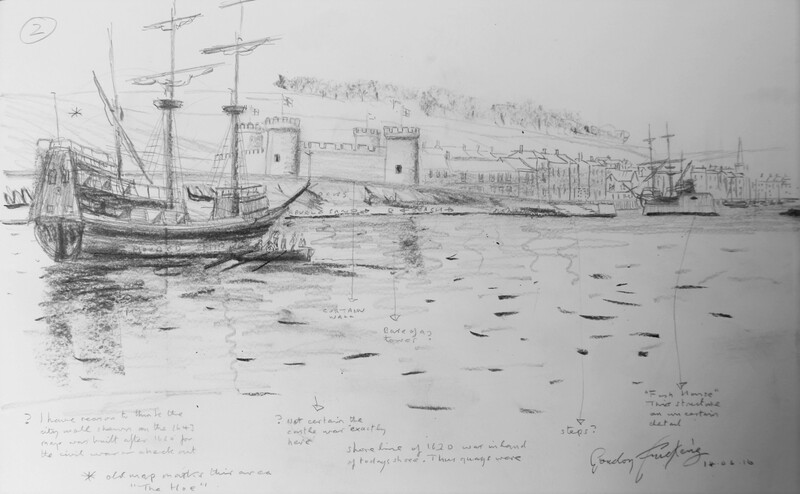 Hyperlink > Mayflower, Plymouth, & Sutton Harbour, SE view, 2 concept sketch, available, £130. 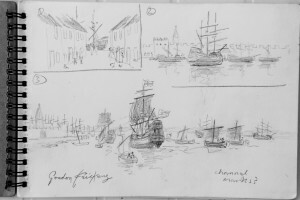 “The Mayflower Collection” paintings of Harwich, the port where she outfitted and Plymouth her port of final departure. 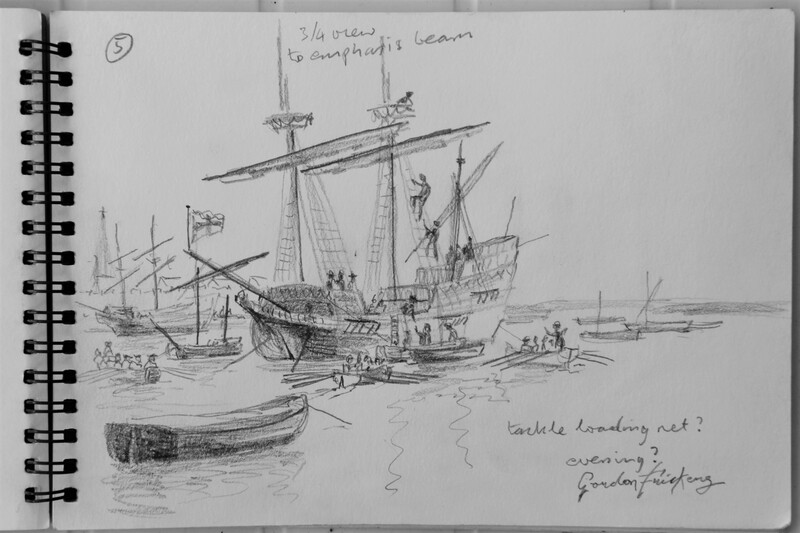 These newly researched scenes of The Mayflower’s famous voyage will thus be a fresh and authoritative visualisation, an aid contributing to the 400 th anniversary celebrations. They will endure long after the event, speaking of us today as well as of the original adventure, continuing to be seen as memorable by future generations, literally becoming a part of The Mayflower story. 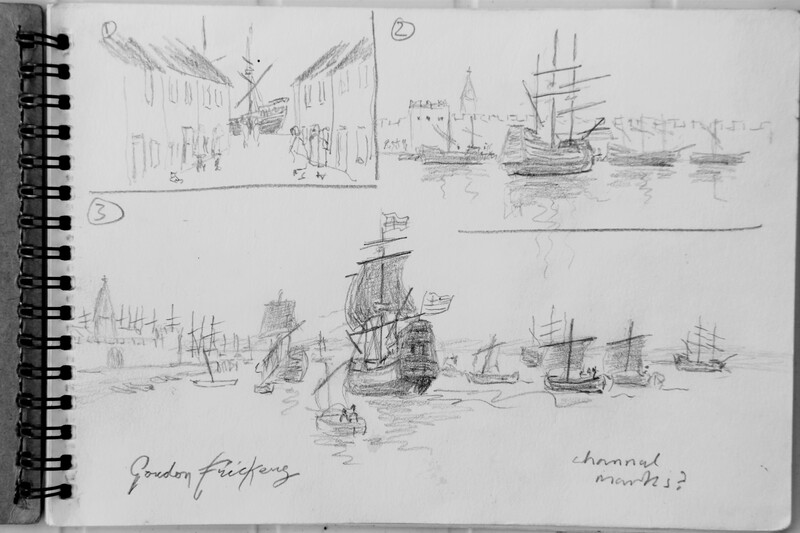 The attached ‘concept sketches’ are of the series I am actively researching. The new paintings will be for sale; I will of course continue to accept other commissions. My research has already taken me to many places including Harwich and Plymouth. An exciting idea, The Harwich Mayflower Project is helping revitalise Harwich and has a site for building a new ship, the latter in part as a youth opportunity facility. By proposing to build a new ship representing the latest research, if well handled, HMP could hugely benefit British and American businesses a great opportunity for a major sponsor. If you wish commission or to know more don’t hesitate connect with me. In The Mayflower and Pilgrim Fathers story the significance of Harwich has been neglected, yet it is a key event. 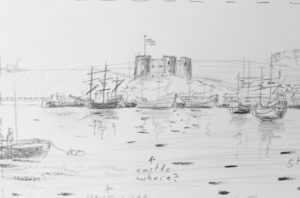 Along time a gateway port for Europe, the Mayflower was fitted out and stored at Harwich for her voyage onto the first page of the United States history. Her Captain and some of the crew were Harwich men.